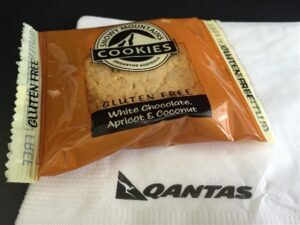 Travelling with coeliac disease can present extra challenges, but Qantas have always provided me something gluten free on a domestic flight, even if it is just an apple or a cookie for a short trip. You make your special meal request under ‘manage your booking’ – please see the notes at the bottom of the post for more information on this. 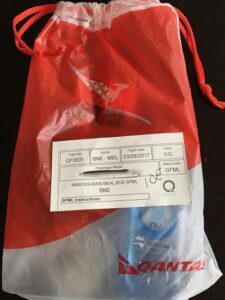 It is a good idea to take emergency snacks with you as there is always a risk that the meal doesn’t get loaded or that you have to switch flights for some reason and your meal can’t follow you (this has happened to me twice). Click here for some ideas of snacks to take with you. 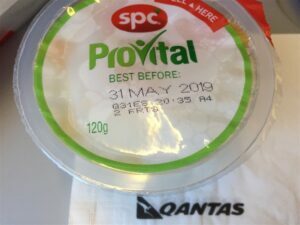 Below documents some of the meals I have had on various routes within Australia in economy (Melbourne to Sydney, Brisbane and Cairns). 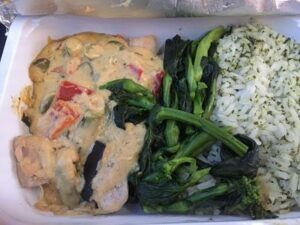 I have enjoyed the meals prepared by Rowie’s Cakes, which is a 100% gluten free kitchen and also caters for multiple food intolerances. 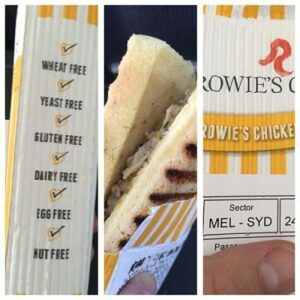 Rowie’s offerings have been supplied for lunch and I really enjoyed the chicken toastie. The burger had a soggy bottom which detracted from the texture, but the overall the taste was pretty good. For evening meals, there is often a curry, which suits me fine! 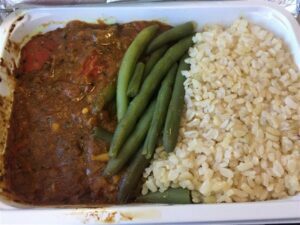 Much better for me than fish, which seems to be the standard gluten free option on international flights. 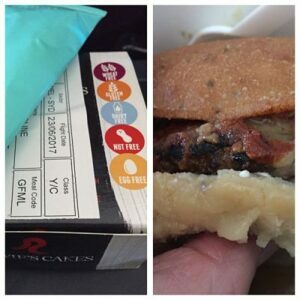 With a main meal you often receive a ‘meal bag’ with a water, cutlery, soy milk for coffee and a cake. 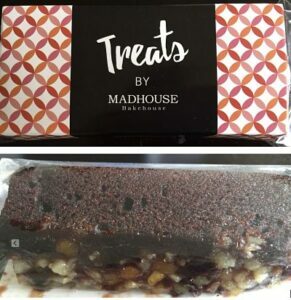 I hadn’t heard of Treats by Madhouse before so contacted them to find out how they prepare their gluten free items and found that they follow strict wash down and testing procedures, including testing final products for traces of gluten. A sample of a cooked breakfast is below. I’m not a huge fan of a cooked breakfast, but it was OK if you are hungry. 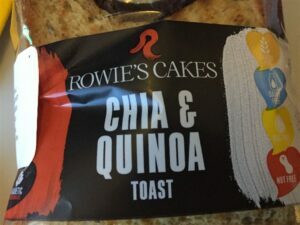 I was feeling optimistic when I was given a Rowie’s chia & quinoa toast, but it was cold which was not that appealing. I’m not sure if it was meant to be warmed! If you have requested a special meal before, you know you will be served well ahead of everyone else. This means you don’t get to eat with your travel companions and have usually finished your meal before the drinks trolley comes around (although you usually get a small water wash your meal down with). meals are inclusive of your fare. 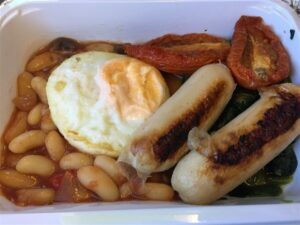 I also found some interesting information on the labelling of inflight meals on the gluten free travel website. If you are flying from Melbourne or Sydney, see the links to airport information below!